If you answered "yes" to all of these questions (and who wouldn't? ), exercise is the answer. You might be surprised at how, say, popping in a workout tape for 30 minutes in the morning can change your whole day. When endorphins are released into your bloodstream during exercise, says Astorino, "you feel much more energized the rest of the day." Think of what exercising with a partner can do for a relationship, whether it's with a spouse, a sibling, or a friend you used to go to lunch with once a week. Not only that, says Astorino, but exercise is always more fun when there's someone to do it with. So plan to walk with your spouse after dinner every night. Meet your sister or that friend for tennis or an aerobics class instead of lunch. "For long-term weight loss, you need to have social support," Astorino says. "Because exercise strengthens the muscles and joints, it is going to reduce your odds of having some of those aches and pains and problems most adults have, mostly because of the inactive lives they lead," Bryant says. Provided you don't overdo it, he says, exercise can even boost immune function -- so you spend less time down with a cold or flu. "There isn't a major health problem where exercise cannot have a positive effect," says Byrant. Not only does exercise help fight disease, says Bryant, it creates a stronger heart -- the most important muscle in the body. That helps makes exercise -- and the activities of daily life -- feel easier. "Your heart and cardiovascular system will function more effectively," says Bryant. "The heart will build up less plaque. It will become a more efficient pump." And "when the heart becomes stronger, it pumps more blood per beat, so at rest, the heart rate is lower," says Astorino. "It's not going to have to beat as fast" to expend the same amount of effort. Within only a couple days after you start exercising, Astorino says, "the body readily adapts to the stimulus it's getting and it becomes easier. You will feel less fatigue. It will not take as much effort when it comes to breathing. You shouldn't have as much pain or soreness." Pound for pound, muscle burns more calories at rest than body fat. So the more muscle you have, the higher your resting metabolic rate. And, of course, you also burn calories while you're actually exercising. All this means that "cheating" with a cookie once in a while isn't going to take you back 10 steps. "Can you eat anything? No," says Atkinson. "But you can afford to enjoy some of the things you really like when you exercise regularly. You can better get away with those things in moderation than you can when you're not working out." 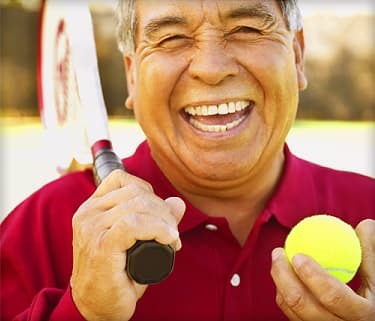 You may also notice your newly pumped-up muscles in other ways, especially if you're a recreational golfer or tennis player, or like a friendly game of pick-up basketball, says Atkinson. Exercising consistently will strengthen your muscles, increase flexibility, and improve your overall performance. "Your muscles will work much more efficiently and you'll gain a greater sense of endurance," says Bryant. In addition, he says, your reaction time and balance will improve. Weight loss is the reason many people exercise in the first place. But it's certainly not the sole benefit of an exercise program. Bryant says the long-term goal of weight loss is sold too heavily to people starting fitness programs, and that can be discouraging. People have trouble sticking with something if they don't see results quickly. "Really, they should think about the level of functioning in the activities of daily living," says Bryant. "That can serve as the motivation to keep them coming back for more." So whatever weight loss goal you have when starting a fitness program, don't make it your only goal. Strive to feel better, to have more energy, to be less stressed. Notice the small things that exercise does for you quickly, rather than getting hung up on the narrow goal of the number on a scale. "With a goal of losing weight and enhancing health, exercise has to become a part of a person's life, not an afterthought," Astorino says. SOURCES: David Atkinson, certified trainer; director of program development, Cooper Ventures, a division of the Cooper Aerobics Center, Dallas. Todd A. Astorino, exercise physiologist; assistant professor of kinesiology, California State University, San Marcos. Cedric Bryant, chief exercise physiologist, American Council on Exercise, San Diego.